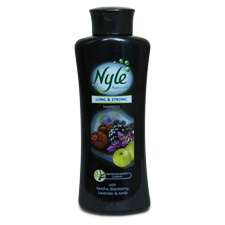 Buy Cavinkare Nyle Naturals Long and Strong Shampoo. Long and Strong Nourishes. Promote thick and healthy hair growth. Every drop of Nyle shampoo contains a unique Nutrition-Boost Complex, filled with the goodness of reetha, amla, blackberry and lavender. Nyle Long and Strong Shampoo nourishes your scalp and hair helping to promote thick and healthy hair growth. Reetha: Reetha is a natural conditioner that makes your hair healthy. Amla: Amla nourishes your hair from root to tip making it healthy. Blackberry: Blackberry rich in Vitamin E nourishes your hair making it shiny while lavender helps in maintaining a healthy scalp.